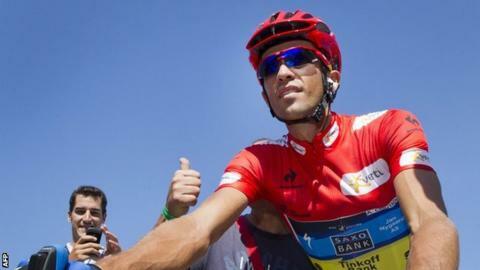 Alberto Contador is poised to secure his second Vuelta a Espana title after remaining more than a minute clear following the penultimate stage. Spaniard Contador, in his first Grand Tour since a drugs ban, can be denied victory only by injury or mechanical failure in Sunday's final stage. Alejandro Valverde, 1:35 adrift at the outset, made up 19 seconds and Joaquim Rodriguez (2:21 down) 44 seconds. But Contador has a 1:16 lead after stage 20, won by Russian Denis Menchov. Menchov prevailed after a gruelling battle on the last mountain stage with Team Sky rider Richie Porte, who came in second, 17 seconds back. Porte's British team-mate Chris Froome finished 19th, 4:43 behind, which was enough for him to hold on to fourth in the overall standings. Rodriguez and Valverde both pulled away from Contador in the final kilometre but not enough to derail the 2008 Vuelta champion. The double Tour de France winner was found guilty of doping after testing positive for clenbuterol during the 2010 Tour and was given a backdated two-year ban earlier this year - losing his 2010 Tour and 2011 Giro titles as a result - and was out of competition for six months before returning in August. 1. Denis Menchov (Rus/Katusha) 4:48:48"
2. Richie Porte (Aus/Team Sky) +17"
3. Kevin De Weert (Bel/Omega Pharma) +42"
4. Fredrik Kessiakoff (Swe/Astana) +1:16"
5. Romain Sicard (Fra/Euskaltel) +1:39"
6. Eros Capecchi (Ita/Liquigas) +2:30"
7. Maxime Bouet (Fra/AG2R) +2:39"
8. Simon Geschke (Ger/Argos) +3:14"
9. Joaquim Rodriguez (Spa/Katusha) +3:31"
10. Alejandro Valverde (Spa/Movistar) +3:56"
11. Tiago Machado (Por/RadioShack) +4:08"
12. Alberto Contador (Spa/Saxo Bank) +4:15"
19. Chris Froome (Britain/Team Sky) +4:43"
1. Alberto Contador (Spa/Saxo Bank) 82:14:52"
4. Chris Froome (GB/Team Sky) +10:16"